The southeast corner of the state was rocked last Friday night when Nu-metal pioneers Korn and masked metal giants Slipknot invaded the Mohegan Sun arena. Their appearance in Connecticut fell almost exactly in the middle of their "Prepare For Hell" tour so any kinks the show may have had earlier in the tour have been worked out as both bands ran through their sets like well-oiled machines. The night began with a short set from newcomers King 810, whose growling vocals were difficult to understand, but their sound definitely set the stage for a night of head-banging metal. Korn entered the stage to a thunderous introduction before diving into their catalog of hits with crowd favorites "Here To Stay" and "Right Now." Lead singer Jonathon Davis moved along the stage, keeping the activity going on the general admission floor as mosh pits broke out during the frenzy of "Falling Away From Me." Davis brought out his bagpipes for the beginning of the Korn-themed nursery rhyme "Shoots And Ladders," which finished with an explosive version of Metallica's "One." Their 50-minute set closed with "Blind," from Korn's self-titled debut album, which turned the floor into an unsettled sea of people banging their heads in unison to the energetic, adrenalized music. Now, if you've never seen the band Slipknot perform live, then you are in for one hell of a show. 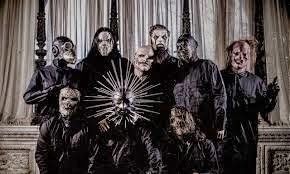 After a short introduction, which mirrors the beginning of their latest album ".5 The Grey Chapter," the curtain raised and the stage came to life, turning the 9-piece band into a carnival ride from hell. The night was filled with flames and hydraulics, fist pumps, crowd surfing and of course, mosh pits. After the first song, "Sarcastrophe," the masks that the band wears seemed normal and actually added to the atmosphere of this uniquely engaging metal show. New songs, "The Devil And I" and "The Negative One" fit perfectly alongside fan favorites "Duality" and "Spit It Out." Lead singer Corey Taylor told the audience, that "this is a long way from the Webster Theatre," where the band used to perform in the early days and the audience showed their appreciated of the band with screams and applause that matched the music's intensity. They closed their set with "Custer," also from the band's latest album and nobody was ready to surrender and exit the arena without leaving all their energy on the floor. The band returned for the quick, two-song encore, which got the crowd singing along to their concert staple "People=Sh*t" and raised their middle fingers in unison for the Slipknot national anthem "Surfacing." As a recording of the band's song "Til We Die" played over the speakers, fans found themselves physically drained, but emotional high as heavy metal ruled once again at Mohegan Sun.